Um er-Rasas (Kastron Mefa'a) is an archeological site which contains ruins from the Roman, Byzantine and early Muslim civilizations. It was an important Christian pilgrimage center in the 8th century. There were at least 16 churches here, and pilgrims travelled from afar to see and consult the Stylite monks that lived on stone towers. One of those towers (13m high) is still standing. The majority of the site has not been excavated. It has survived undisturbed for 1200 years and has a high level of authenticity. Among the portions excavated so far include the Roman military camp, 'Kastron Mefaa', a frontier camp of the Limus Arabicus. and several churches. The remains date from between the late 3rd and end of the 9th century. 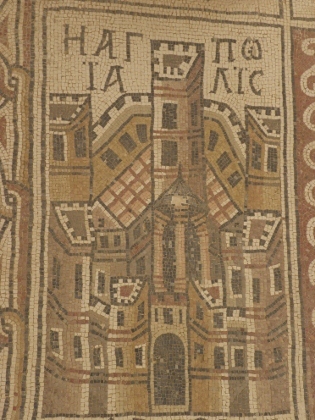 Particularly noteworthy is the mosaic floor of the Byzantine Church of Saint Stephen with its representation of towns in the region. 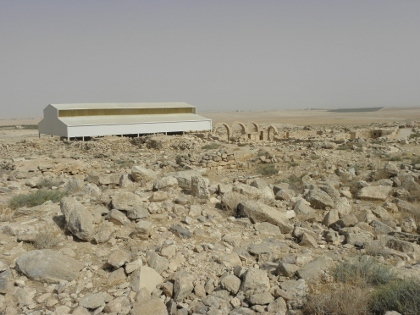 Um-er Rasas lies about 30km south of Jordan's mosaic capital, Madaba. It is signposted all the way. The only thing that you have to be careful about are Jordan's infamous speed bumps. The surrounding landscape is unbelievably dry and empty. No wonder that it took so long to excavate this archeological site: only in 1986 work was started. As other posters have already mentioned, there's a large visitor center and it has no less than two parking lots that also have spaces for numerous buses. However - the visitor center still seems to be closed, even on a Friday (first day of the weekend for the Jordanians). A group of French tourists was just leaving when I arrived, and one family entered with me. We all did so without paying an entrance fee, as the ticket office was as closed as the restaurant, the souvenir shop and the museum. The main site is quite extensive, and without shade except for the covered building that houses the mosaics. I walked there as fast as I could under the radiating sun. The French that I encountered at the entrance all had very red heads, and that's anybody's fate here I guess. 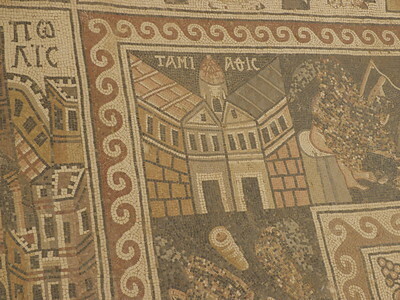 After having seen several mosaics in Madaba this morning, I wondered about what Um-er Rasas had to add. Most organized tours only make a short stop at Madaba and skip Um-er Rasas alltogether. 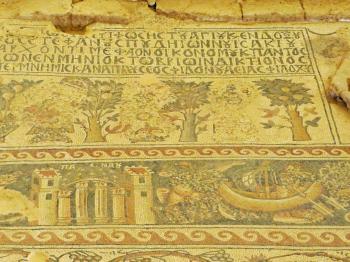 Well, the design of the mosaics are quite similar, but these here seem to be almost intact and much better preserved. The colours are darker, the designs more sharpened. There are geographical mosaics here too, just as in St. George's Church in Madaba. The ones here are little icons that represent cities such as Caesarea and Philadelphia (now Amman). I didn't spent much time at the rest of the archeological complex. It looked like several piles of rubble to me. A lot of excavation and explanation still has to be done. So I got back in the car to drive to the enigmatic Stylite tower. It can be seen from the main area, but it's over a kilometer away. 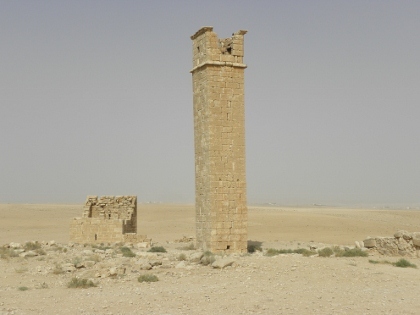 The tower has been well-restored, and now is a lonely reminder of what Um-er Rasas looked like 1200 years ago. I find the story of the ascetic monks fascinating, and it probably needed a location as forgotten as Um-er Rasas to preserve this. Of the four inscribed Jordanian World Heritage Sites I visited in spring 2015, Um er-Rasas was the one for which I had the least expectations, but I'm glad I went because I loved the mosaics in the church of St Stephen. The level of detail that went into the tessellated floors was impressive, depicting 8th century cities, flora and fauna, and scenes of daily life. Jordan has done a good job protecting the mosaics, with a shelter over the church and glass walkways that allow visitors to get close to the mosaics without damaging the floors. The remainder of the site outside the church is also well worth exploring, including the remains of an old Roman fort, homes, and other Byzantine churches. The visitor's center was closed when I arrived, as other visitors have noted, and there was no one selling tickets despite my arrival during scheduled opening hours; nevertheless the site was open and accessible. In addition to visiting the mosaics at Um er-Rasas, I also highly recommend a stop at the church of St. George in nearby Madaba, which has a renowned 6th century mosaic of Jerusalem and the Holy Land. Logistics: Um er-Rasas is accessible by car, and is a short detour off the King's Highway south of Madaba. i've worked in this archeological site, every summer season since 1989 to the end of my thesis in the 1998. I was there to made the survey of the ruin during the excavation of lions church, pavoni church, and the rest of the area. it's a special place full of history, unique for the presence of the mosaics floor and for the structures made of stone with their arches. I visited this WHS in April 2010. The mosaics are still in very good conditions considering that they date back from between the 1st century and the 8th century AD. Unfortunately, the ruins aren't as aesthetically beautiful as others in Jerash. I visited Un er-Rasas on a short trip from Madaba, with a rental car. The road is more or less signe-posted from either the King's Road or the Desert Highway (small road on the right shortly after the airport). We arrived in the late afternoon. They is quite a big vistors' center, but only the tourist police station was open. The ticket office was closed, so we entered for free. We were the only persons on the site. The site consists of a large ruined city in various stage of restoration. The interesting part is the churches mosaic floors. The St Stephen church floor is visited from a stairway, an is covered by a kind of hangar. The floors are spectacular representing animals, flowers as well as towns of the region. We then moved to the church of Lions. 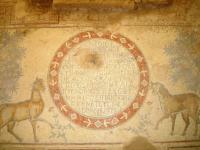 It seemed rather tame, covered with sand, until we discovered that under the sand lies the mosaics. Part of them only are visible, but getting on your knee's to push the sand aside to reveal the mosaic gives the impression to be the first person to uncovered a treasure. We then climbed walls to get to the churches of the River and of the Palm Tree with more mosaics to uncovered. About 2 km north of the site, we finished visiting the stylites tower, which is now completely restored. So I was in Jordan in March and did not want to miss this site and hired a driver to take my son and I out to Um er Rasas. The driver was a tour guide and he is out with tourists every day but he confessed that he has not been to this site in the last four years as no one wants to visit it! He took several wrong turns but a local farmer pointed us to the right road. When we arrived, there is a beautiful brand new visitor's center. However the parking lot was empty as we were the only visitors at that time. Also all the facilities were not open except the rest rooms. The restaurant, visitor's hall, ticket office were all closed. The guard showed us to the back gate which opens to the site. The previous descriptions are accurate. A whole pile of rocks strewn over a very large area. We walked around for a while taking pictures and then headed to a hangar like structure that covered the mosaics of St Stephen. The mosaics were superb and well worth the visit and the viewing platform allowed a top down view. Later we visited the stylite tower sitting by the road. Unfortunately, it is still being restored with scaffolding. On the other hand, since no one was on site, my son and I climbed the stairs of the scaffolding to the top of the tower and had a great view of the surrounding area from nearly 50 feet up. We also looked into the top cavity to see what its like to sit in there for years and saw a lot of bird eggs. Not for everyone but we had fun. I have visited the site in February 2008. From the main road is just a huge pile of stones (visible area of former fortified Roman Camp) but a lot of works have been done in the area of former Byzantine town. All the mosaics were covered with sand and wood to protect them while building roof (preservation project, grant from European Union). Also the "mystery tower" - another part of heritage - was covered with scaffoldings. What a bad luck. At that time the site was open to visitors free of charge with no tourist facilities. But the area is worth visiting, easy to reach by car from main road Amman-Aqaba. Quite recently appointed World Heritage Site, the Um er-Rasas (Kastrom Mefa'a) site first makes you wonder whether it belongs on the list at all? As this, almost non-excavated, site looks right now its more of a heap of rubble than anything else...! Some serious archeological work is needed here before you can make sense of this place. However, what makes it worth the effort of visiting, are the magnificent Roman mosaics in the small church of Saint Stephen. Restored by anastylosis: AB evaluation "The arches were reconstructed as full anastylosis"